This project was submitted by Panda Hall Stock and is one of many in their learning center. 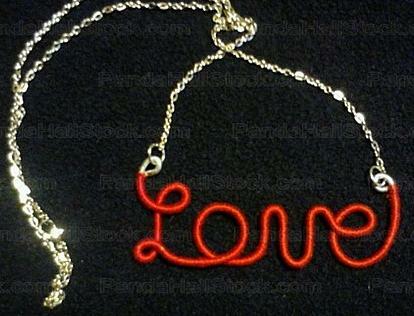 This is a fantastic necklace that can be personalized with a name or any other word that you like. And, it's the perfect fashion statement - to make AND to wear! First, draw on paper how you want your name or word to look. Once you've done that, you can start building the necklace. Using the pliers, bend one end of the brass wire into a closed loop. Tie the wax cord onto the wire with a secure knot and then begin wrapping it tightly around the length of the wire. Using your drawing as a guide, begin to shape the name or word. NOTE: Depending on the letters in the word or name you've chosen, it's sometimes easier to wrap the wire as you shape it rather than shape the entire word first. When the entire name or word is wrapped, tie off the end of the wax cord. Leaving enough wire to make a closing loop, cut off the excess wire. Bend the remaining wire into a closed loop like you did in Step 1. Attach a jump ring in each closed loop. Attach each end of the chain to the jump rings.